1 onion, chopped into 1 inch pieces. 1. In a medium saucepan, mix buckwheat with 2 cups of water. Cook on medium high heat and bring to a boil. Turn heat to low, cover and cook until all the water is gone and buckwheat is soft, about 20 minutes. 2. In a heavy skillet or cast iron fry pan, turn heat to medium high. Add onions and saute dry, stirring regularly. Turn heat down if onions start to burn. Cook about 10 minutes until onions are translucent and slightly brown. 3. 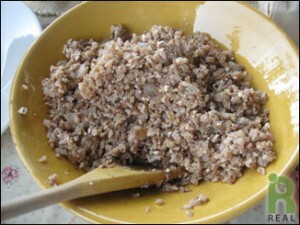 Add buckwheat and tofu and mix to incorporate. Cook about 5 minutes. If buckwheat sticks to pan add a little water to loosen. Cook until steams off. Remove from heat and serve.